First elephant folio Johnson map of Ohio. This is an 1864 A. J. Johnson map of Ohio. This map depicts the state of Ohio from Indiana to Pennsylvania and from Lake Erie and Michigan to Kentucky and West Virginia. Myriad cities, towns are labeled, along with railways, ferries and roads. Counties are labeled as well, with colors used to differentiate between them. 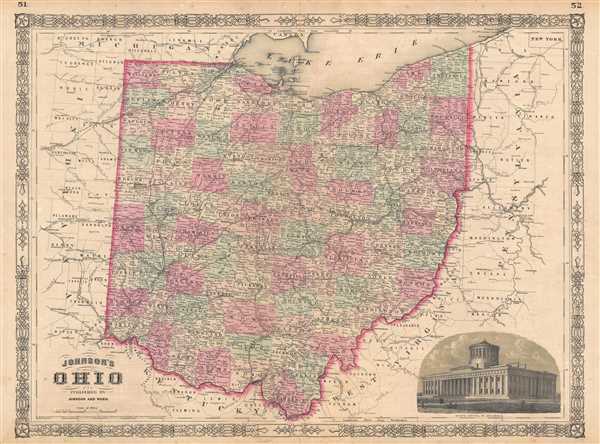 Johnson introduced this large folio map in the 1864 edition of his atlas, replacing the single page Ohio map that he inherited from Colton. The expanded map was necessary to account for the boom in Ohio's population that occurred in the previous decade. An engraved view of the Columbus state house appears in the lower right corner and it features the fretwork style border common to Johnson's atlas work from 1863 to 1869. Very good. Even overall toning. Light foxing. Verso repairs of centerfold separations. Text on verso.